The jobs feature is used to track hours worked by employees and performing Cost-Centre analysis on those hours. Why track hours with Jobs? Tracking hours within different departments, locations, projects etc. 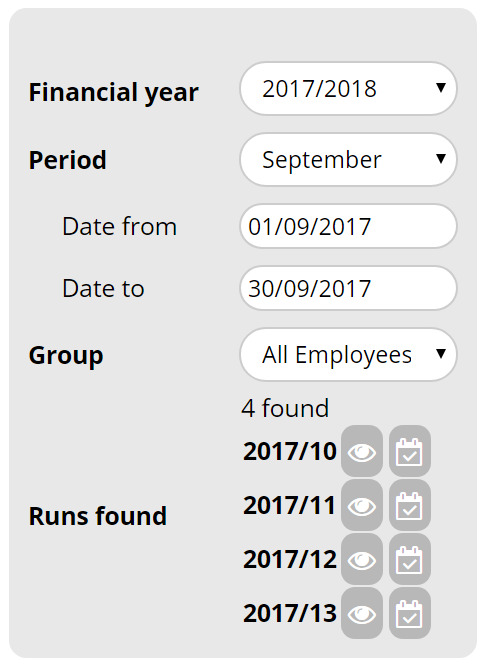 by using the Jobs feature will allow you to successfully analyse how your workers time is being spent split by departments. Employees will be able to clock onto Jobs which will assign the hours of work to a specific Job when evaluated this can demonstrate which areas of the business are profitable. To create a new job click the blue Add New Job button, the below form will appear. Once you have completed the form select the Blue Add Job button. If the job is currently active, use the drop-down box in under the Status column to make it active. Clicking Edit brings up the Add Job form, which will allow you to modify the Job. 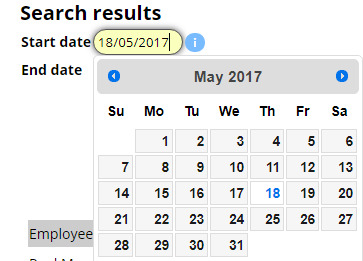 To analyse the hours spent on a job, click the grey Hours button to the right-hand side of the screen whilst on the Jobs page. Additionally when clicking Search without entering any information the search then automatically restricts from when the job was started to when the last time hours were assigned to it. The Top of the screen will give you Job Details, so the title, Start Date, and Deadline and on the right will be the total hours worked on this job for the selected period. The Employee Breakdown on the left consists of all the hours each individual employee has spent on that Job during the specified period. The right has all of the notes that have been attached to the shifts. At the bottom is a full shift breakdown of every shift that job has been assigned to. 4 Manual Job Entry The job is entered manually into the time-sheet once the shift is complete. Each of these methods will require set-up as described below. When setting up the Fingerprint Scanner, you can enter a Job ID. 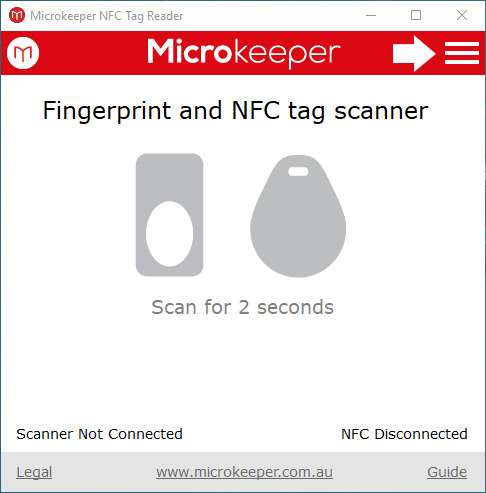 This is best for when you have multiple fingerprint scanners at multiple sites or departments. You can only track a single job from a single fingerprint scanner. 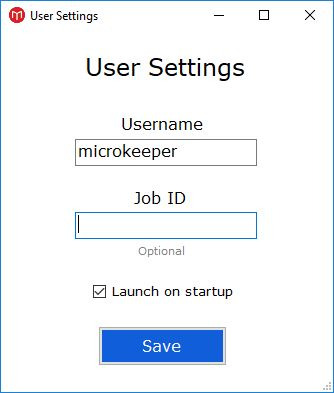 To set it up click on the hamburger menu in the top left of the Microkeeper Timesheet Software installed on your device. Click Settings, which will bring up the below window, you can then enter the Job ID. This will assign all hours clocked with this device to that Job. To find the Job ID, you can go to Menu > Jobs > Jobs. Then in the list of jobs, hover the mouse over the ID number of the job you wish to track, and a small box containing the Job ID will appear. EG The below Job ID is 1234. When tracking jobs via the roster, you will assign a Job to the Locations within your roster. Then when rostered onto the Location that has a Job assigned to it, all clocked hours by that employee will be automatically assigned to that Job. To set up, go to Settings >General > Locations. Click the grey edit button to the right of the Location you wish to add job tracking to. Then roster onto your locations as normal, and the hours clocked at each location will be assigned to the corresponding job automatically. Sometimes, a Location may be assigned multiple jobs, and it needs to be assigned on the Roster dynamically. Firstly you'll need to set up the Jobs and Client they are assigned to. Click add a new Job. 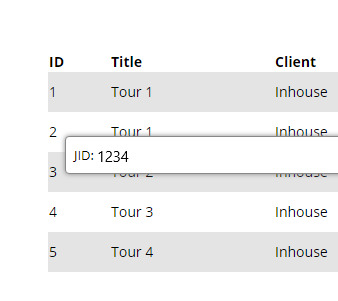 Select Add new Client if you don't haven't got any setup and complete the New Client Form other use the drop down box and select the Client the job is assigned too. Then go to the Roster (Payroll > Rosters) and you will be able to assign the Jobs that have the Client to those shifts. 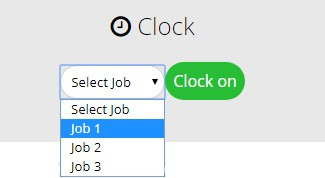 In Employee Job Tracking, the employee has the ability to select which Job they want to clock onto, this can also be restricted by location. For example, they can only clock on to jobs they are at the corresponding location too. 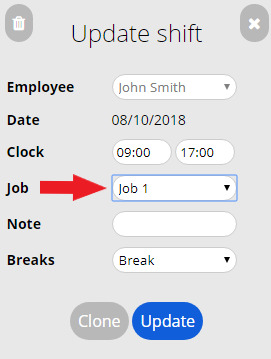 Once logged into the Employee Console, your employee will see a drop-down box in the middle of the screen, they will be able to select which job they need their hours to be assigned to. NOTE: If you are using the Location Restricted Clocking, employee’s will only be able to clock-on to the jobs where the location they are assigned to is within the GPS Radius. To add a Job to a shift in the timesheet, modify the shift by clicking on the Date, or Time of the shift. Then add a job in the Edit Shift form. Tracking hours may not be enough, the business may need to also track the costs of those hours. For example, Overtime, Penalty Rates etc. Then click Update at the bottom of the page to save the change. From the time this is updated, the payruns will now have the job displayed on the payslip. On the left select the time period, employee group etc that you wish to obtain a report for. Then select the drop down box to the right of the Report format you wish to view and select the format you wish to receive the Report in. 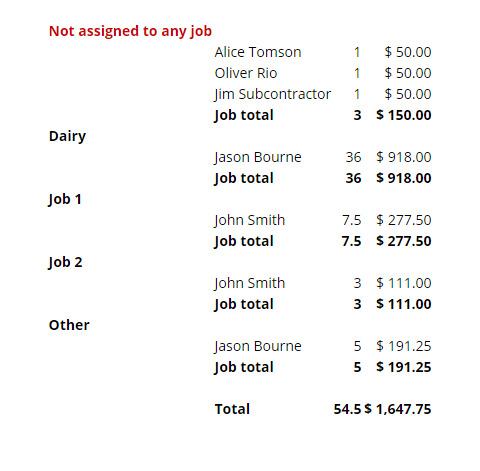 Informs you how much each employee is costing each job.